Have you seen “Jamie Oliver’s Food Revolution”? I watched the first couple of episodes. In it I found out that chicken nuggets are apparently a staple for American kids. Kids who were eating them for lunch at school talked about eating them the night before for dinner. (Pizza and hamburgers were other ones that are staples and I will get to my recipes for those soon.) That show left me, once again, feeling incredibly grateful for Celiac Disease. Why grateful, you may wonder? I’m grateful because my kids will never eat those things at school. They are a nutritional nightmare and my kids have a medical reason to never even get near them. On Jamie’s show one of the lunch ladies kept referring to the list of ingredients and saying “chicken, it’s the first thing on the label,” or for the potato pearls they use to make some sort of glue that they serve under the rouse of mashed potatoes; “potatoes, the number one ingredient.” She said this like as if all those other things on the label after the first ingredient are just other foods and don’t really matter. They are not just other foods that don’t matter. Most of them are not food at all. In so many processed foods there is white flour, which even if we could eat that we wouldn’t because it is really nothing more than sugar, metabolically speaking. It offers no nutrition. It offers carbohydrate aka sugar. There are stabilizers, preservatives, fillers, coloring, starches, sugar, high fructose corn syrup, anti foaming agents and hydrogenated oils (In case you didn’t know hydrogenated means trans fats. Reasearch has proven that trans fats cause cancer and heart disease.) Here is a link to McDonald’s web site that lists every ingredient in all of their food. The McNuggets are on the fifth page. I chose to illustrate my point using McDonald’s nuggets because years ago they were my favorite. I loved those things. Prior to Celiac Disease my daughters loved them too. Who doesn’t? Look at those ingredients. Forty some ingredients in there. Mmmmmm. Makes you want to run straight over to your nearest Mickey D’s (which is likely within a mile of where ever you are) doesn’t it. Ugh. Gross. I make chicken fingers here at home regularly. It is a favorite for all of us. I use a couple fewer ingredients. Additionally I cook them in coconut oil so we are getting a good fat to go along with it. It is really pretty quick and they are even good warmed up. Sometimes I will make dips to go with them but mayo is the kids favorite. (Making my own mayo with coconut oil is on my to do list.) I make them 2 ways and both are well liked here. One is really low carb, one is not. Heat a generous amount of coconut oil (if you use expeller pressed it doesn’t taste like coconut) in a large frying pan over medium heat. In medium bowl beat eggs. In second bowl or pie plate combine remaining ingredients and mix until combined. 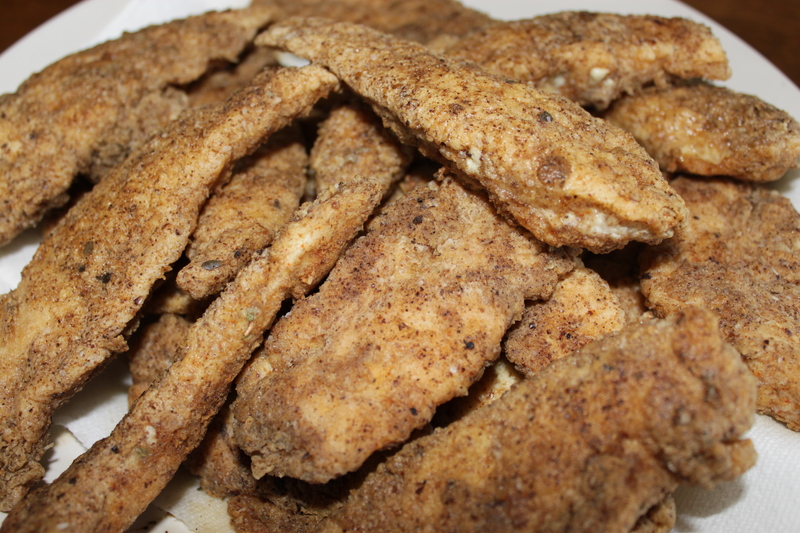 With each chicken tender coat in egg first and then coat evenly with flour/flax seed mix. Fry until lightly browned on both sides and serve hot. If you are doing this the low carb way, omit the gf flour and lower your heat to medium low. The flax seeds brown pretty quickly so it is easy to burn. I like to serve these with “fries”. I cut up carrots, sweet potato and white potatoes into “fries”. I coat with, yes, more coconut oil, salt and pepper or whatever sounds good to me at the moment. Bake them at 425 for 20-30 minutes until they are cooked through and are crispy at the edges. And there you have it, chicken fingers and fries, gluten free, dairy free, low carb (or not), REAL FOOD. 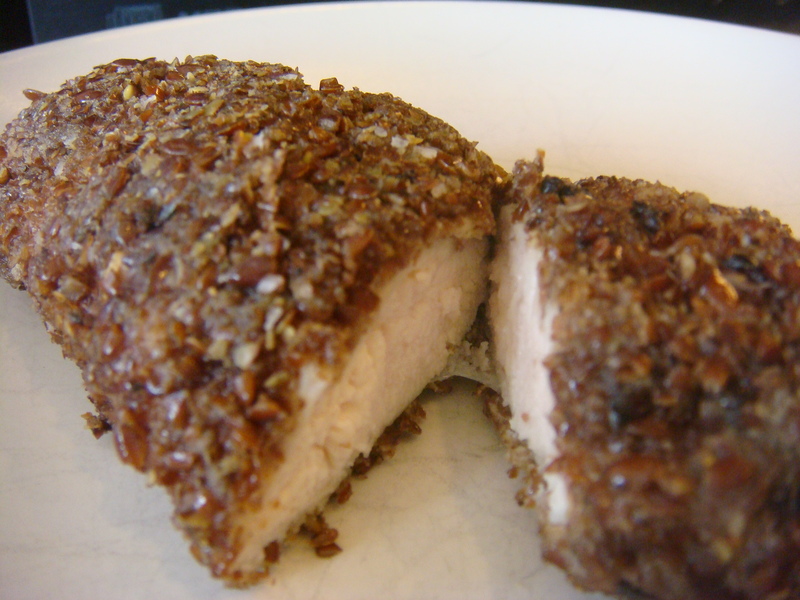 fried and spiced well, and so easy. It just isn’t good for us, even without considering the gluten! aspect. I’m glad you included the low carb version, hubby wants to try low carb. I know what you mean. I am on “vacation” visiting family right now so I am not in my own kitchen, in my own element, right now. I am having to take short cuts. It is just killing me to feed my kids (and myself) prepackaged gluten free stuff. It may be gf but it is still garbage. When I saw that episode on Jamie Oliver’s Food Revolution, I was surprised with the kids reaction to the chicken nuggets, Im glad you shared this recipe because a lot of Moms out there really need healthier recipes for the food they love. If you won’t mind I’d love to guide Foodista readers to this post.Just add the foodista widget to the end of this post and it’s all set, Thanks! I’d love to do that but I have a wordpress.com blog so I don’t think that I am able to add widgets into posts. Thanks though! You found me there?! I have no idea how that happened. Did you enter a search term? Yahoo news… I’m mystified. Cool tho!